Representing more than 65 years of combined experience with Mercedes-Benz parts, the three-person wholesale team at Atlanta Classic Cars reflects the dealership's 37-plus-years heritage of professional, customer-first service. Located just northeast of Atlanta at I-85 and 316, the Duluth-based Atlanta Classic Cars was the first Mercedes-Benz franchise in the Atlanta area. At the store's helm is owner and president Cathy Ellis Hendrix, daughter of founder John Ellis, Sr. When business outgrew its long-time Decatur address, she moved it to Duluth in 2003. 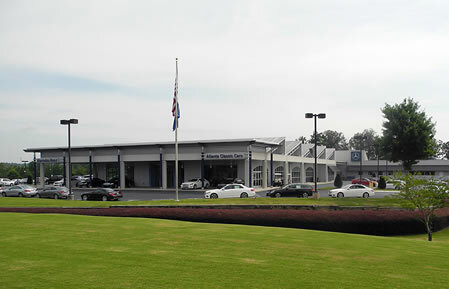 A major expansion in 2005 completed -- at least for the present -- the dealership's brick-and-mortar components. In addition to creating a state-of-the-art collision center, the 2005 expansion doubled the store's parts warehousing capacity to more than 10,000 sq. ft. The on-hand wholesale-parts inventory averages about $2 million, according to wholesale parts manager Jim Janney. "Based on our inventory," Janney said, "our wholesale sales target is $250,000 a month. We usually exceed that and do about $3.0 million in sales a year. That's just in wholesale parts." Pushing parts in one form or another since 1978, Janney is a weathered veteran in the wholesale-parts trenches. After beginning his career at the desk of an outside jobber parts store, he developed his wholesale-parts skills for 10 years at Chevrolet and Mazda dealerships before moving to a Mercedes-Benz store in 1994. Joining Atlanta Classic Cars in 2001, Janney participated in the 2003 move, 2005 expansion and all the growth that came with those changes. "Since I've been here," he said, "our business has increased three-fold, if not more." Speaking with Janney, the pride he takes in his small team, the dealership and the Mercedes-Benz brand is nearly overwhelming. Working out of the building housing ACC Collision Center, John Balizet anchors the team. Nearly 22 of his 27 years of parts experience are with Atlanta Classic Cars. Coming from Lokey Mercedes-Benz in Clearwater, Fla. earlier this year, T.J. Grove may be new to the dealership, but he is no rookie. He has more than 20 years of Mercedes-Benz parts experience under his belt. "When we hired T.J., we were looking for someone who could hit the ground running," Janney explained. "He walked in the door on day one, picked up the phone and started working." Hiring Grove was a rare experience at Atlanta Classic Cars; turnover is held to a minimum. "There is very little turnover at this dealership," Janney said. "I attribute that to the quality of the Mercedes-Benz product and how the dealership trains and equips its staff." The efforts of Balizet and Grove keep two delivery trucks busy hustling parts around the Atlanta area. For deliveries farther out, Janney relies on southeast-based Advantage Delivery and Logistics. "We work closely with Advantage Delivery and Logistics," Janney said. "They have made a big difference in selling parts out of town. We prepay all freight charges for orders over $300. If we get an order early enough in the day, we can turn it around and usually have it to the customer the next day." With an in-stock fill rate averaging 96%, most orders are filled right off the shelf. "Our emphasis is collision parts," Janney stated. "It's our bread and butter." When the odd part that isn't on hand is ordered, often it can be secured from Mercedes-Benz within 24 hours. "Mercedes-Benz has overnight delivery available," Janney said. "I can usually get the parts I don't have in a day." Getting the correct parts into customers' hands quickly is the mark of any successful wholesale-parts operation. Janney's philosophy is to do just that. "I want the customer to know we care," he explained. "I want to build relationships with the people who call us. We want to become partners with the body shops we supply. We are well aware that there are four other Atlanta-area Mercedes-Benz dealers, and our customers don't have to call us. The simple truth is that you can't fix the car without the right part. We want to get that part to them as quickly as possible; so they can finish that car, bring another one in and order more parts." Apparently business is going pretty much according to plan. Janney said the phones ring constantly. According to him, too many ringing phones is a good thing: not enough ringing phones is a bad thing. "We believe that a ringing telephone is not an interruption to our business, but it is our business," he said. "And the phones ring a lot." When asked if there had been one great idea he, his boss Scott Sabia or one of his team had had that really made a big difference in sales, Janney couldn't come up with a single significant one. He thinks it has been a series of smaller changes that have grown the business. He mentioned adapting bar-scanner technology for keeping track of inventory, the introduction of 30-day billing for wholesale customers, the expansion of the parts warehouse and establishing a relationship with Advantage Delivery and Logistics as all contributing to the increased business. Janney also points to the dealership environment encouraging team empowerment as a major factor in his department's sales growth. "Everything here is state of the art," he said. "The dealership equips us with the latest tools and technology to work with. They provide us with the tools, tell us what they want done and we go do it.